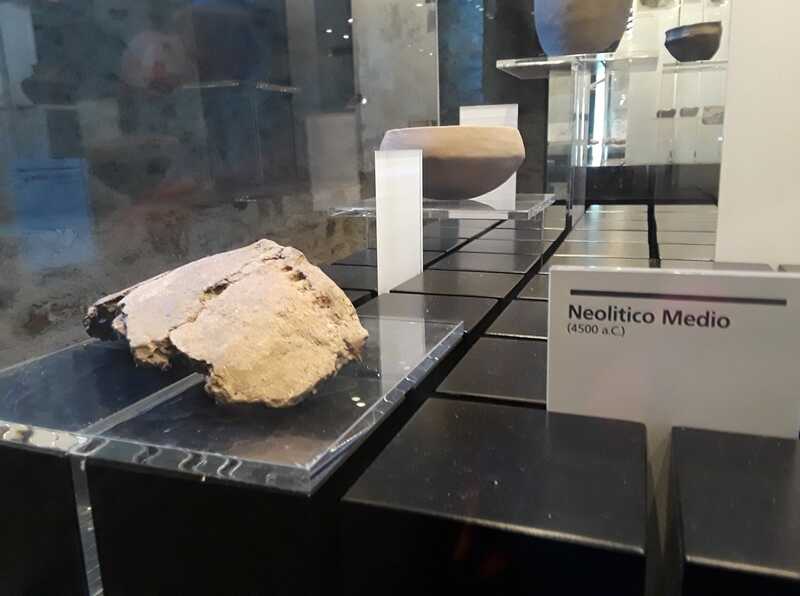 6500 year shard found at elevated site in Bellinzona, Switzerland. There is a common misconception that religious practices first emerged when humans became more sedentary and began to farm. The prehistoric images painted on the walls of rock shelters suggests that this is not the case. These have a religious quality and many anthropologists believe them rock shelters to be have been places of religious ritual. There are 10,000 year temples at high elevations like Gobekli Tepe and Çatalhöyük. At Çatalhöyük the priests wore leopard skins as did the priests of the ancient Upper Nile. These archaic sites indicate organized religion with priests and rituals involving astronomy and the cycle of the seasons. In the Bible these mountain shrines and temples are called "the high places." 7000-6000 years settlements in the Alps were contemporaneous with settlements in the Carpathian mountains and with Europe's oldest city in Bulgaria. At the same time, Galilee received immigrants from the Zagros mountains. This is a photo of a mountain fortification in Bellinzona, Switzerland where 6500 year artifacts have been found. Around 70,000 years ago people living in Southern Africa carved a python out of the side of a cliff and conducted religious ceremonies there. At the back of the Botswana cave was a chamber believed to be a sacred site because there were no signs of animal bones, tools or cooking fires such as those found in South Africa's Blombos Cave of a similar age. 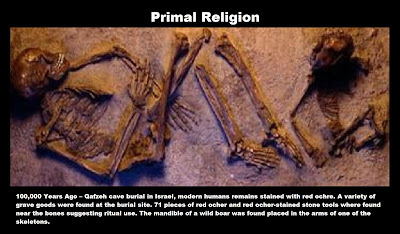 Another phenomena that indicates religious impulse is the 90,000+ years of burial in red ochre, a symbol of blood. This appears to express the hope of life after death. As it says in the Bible: "Life is in the blood." 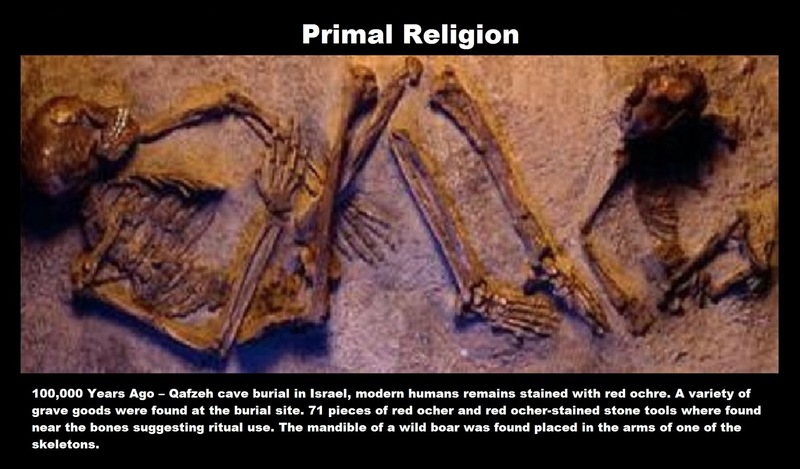 100,000 years ago - Burial of humans in red ochre at Qafzeh Cave in what is today Israel. Evidence of human habitation in the area of Bethlehem between 100,000-10,000 BC) is well-attested along the north side of Wadi Khareitun where there are three caves: Iraq al-Ahmar, Umm Qal’a, and Umm Qatafa. These caves were homes in a wooded landscape overlooking a river. At Umm Qatafa archaeologists have found the earliest evidence of the domestic use of fire in Palestine. 32,000 years ago - Four bodies buried in red ochre at Sungir in Russia. 20,000 years ago - A thirty-year-old man buried in Bavaria surrounded by mammoth tusks and submerged in red ochre. 19,000 years ago - Lady of El Mirón cave in northern Spain was buried in red ochre. She died around the age of 35. 11,000 years ago - A man and woman were buried with a dog in the area of Bonn-Oberkassel, Germany. The corpses were covered with red ochre. 6800 years ago - The Lake Nitchie male was buried with red ochre and was missed two front teeth (ritual removal?). There is no doubt that humans have had a religious impulse from the beginning. It appears to express an awareness of our mortality and a hope for life after death.